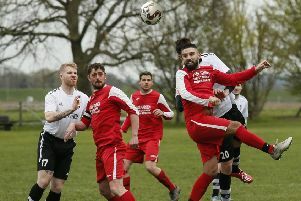 Totternhoe ran out 4-0 winners at Wolverton Town in their Molten Spartan SML Division Two clash on Saturday, with all the goals coming in the first half. Daniel Mills opened the scoring on four minutes, while Adrian Millard (23) made it 2-0 and Ross Morrissey convered a penalty moments later, with Mills on target again just before the break. Kent Athletic won 2-1 at Tring Corinthians, despite trailing to Andrew Wheels-King’s goal on the hour mark. The visitors hit back to take the points courtesy of Rhys Calvano (75) and Christopher Mapp (80). The 61 FC (Luton) were beaten 1-0 at Hale Leys United as Alexander Woodfine’s 68th minute strike sealed victory. In Reserve Division North & West, The 61 FC (Luton) drew 1-1 with Wolverton Town, while Totternhoe saw off Mursley United 3-0. Crawley Green were without game at the weekend, but visit Baldock Town tonight. This weekend, Crawley are at home to Potton United in the Beds FA Senior Trophy quarter-final, while the 61 FC (Luton) entertain Langford in the same competition. Kent Athletic are at Mursley United in the SML Division Two. In Reserve Division North & West, AFC Dunstable host STony Stratford Town, while Crawlet Green host Winslow and the 61 FC (Luton) visit Pitstone & Ivinghoe, with Totternhoe at home to Old Bradwell United. Crawley Green also visit Winslow next Tuesday.